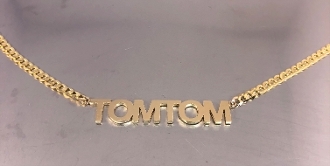 This custom cut out name necklace is set in solid 14 karat yellow gold . It comes on a thick, 14 karat yellow gold chain. You may choose 15, 16, 17, 18. 19 or 20 inches in length for the chain. Kindly include a note with name of preference. This item can be ordered in white or yellow gold. Kindly email us for custom inquiries. Kindly allow 1-2 weeks for production.